Welcome to 2018, Science Peppers! To kick off the new year, we are rallying folks to attend the second-ever “Sac Science Idol” live show in Midtown Sacramento! CapSciComm Networking Social: Sac Science Idol II! 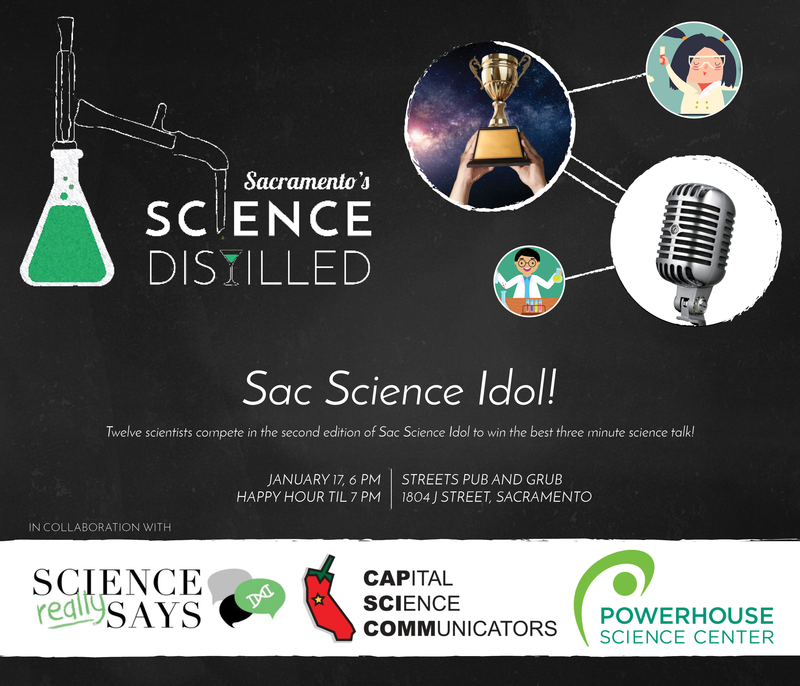 “Sac Science Idol” is a special production of the Sac Science Distilled science café series (see CapSciComm page and origin story). This is your chance to see graduate students and early career scientists from around the Capital Region compete to give their best “lightning talk” explaining a research topic — three minutes, no PowerPoint slides, and one microphone. It’s just their enthusiasm, creativity, and panache on stage, sharing their excitement for science with you! Special guests Cambi Brown (Good Day), Mellisa Paul (Sac & Co.), and Darren Peck (FOX40) are on deck as the judges for Sac Science Idol II — and everyone will get to vote for the audience choice award winner, and play for bingo and trivia prizes! So come by early to mingle and grab choice seats, then stay late after to catch up with old colleagues and new friends! Our thanks to Sac Science Distilled, Science Says, and the Powerhouse Science Center for their continued hard work organizing this fantastic evening entertainment series — we congratulate them on all they’ve achieved in year one of making science fun on The Grid. Please RSVP to help us plan, and we’ll see you on January 17th. Keep science spicy, Sacramento!